I am fortunate in that I work with technology and have access to the latest in wet cycling shoe drying systems. Among several choices I have most recently been favouring the HP 10642 G2 rack with dual HP Proliant DL380 G5 servers, although pretty much any servers will do since they all make heat and include good fans to move it away. In terms of heat generation, the more servers in the rack the better. 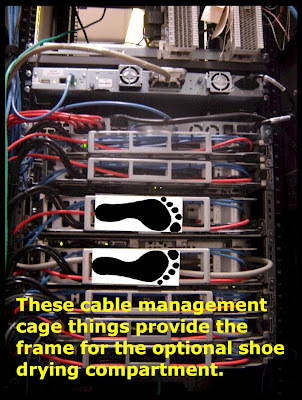 These particular servers take up 2 rack units (or one shoe width) and the cable management cages at the back can be converted into to the optional shoe drying compartment very easily. Let's look at some pictures of this super efficient shoe drying marvel! See? I get to work with some pretty advanced shoe-drying equipment. I do not recommend infiltrating the computer rooms at your workplace and doing something like this on your own. Somebody will probably flip out on you. Ask somebody who is allowed access and is familiar with how it all works, however, and they may well be happy to help you out. 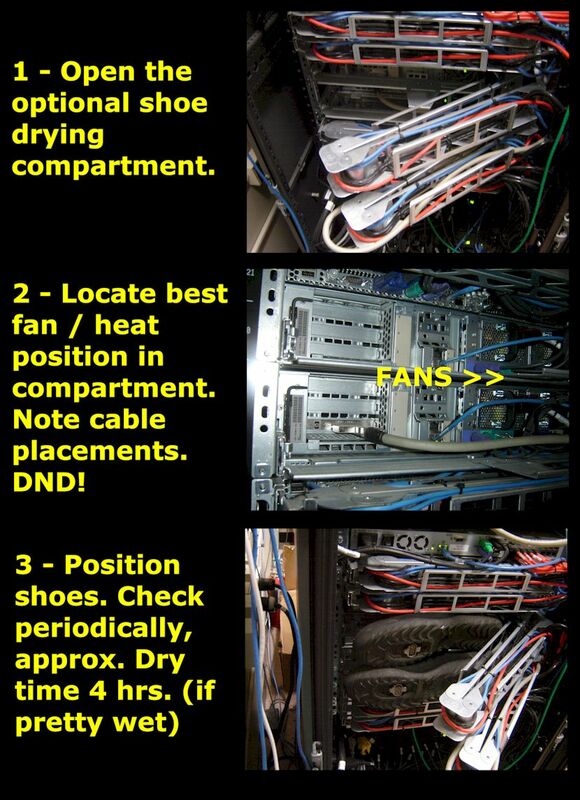 Server racks are also ideal for drying wet clothing, but I have always found soaked shoes to be the bigger challenge. PS - If you are thinking, "Holy Nerd!" at this moment, might I direct you to the source of my footprint graphic, a web site from a local Comp Sci professor named Stephen M. Watt from the University of Western Ontario? I have no doubt whatsoever that this dude operates on an intellectual level well above, um, mine. I can also state with some confidence that he is a bigger nerd than I am. A bigger, more successful, smarter nerd that I envy, but a bigger nerd nonetheless. PPS - I did not take Comp Sci at any time during my academic endeavours and I discovered this local guy's page while simply searching for images of footprints. Go and figger! Won't somebody please think of the servers? It pains me to see this! Hey man, I love my servers! They can still breathe just fine and the room is kept nice and chilly. Just the same, I do regret causing you pain. Used to work with computers many moons ago and I can honestly say I never thought to use them as a clothes drier. Awesome. If they have those push-button cup holder thingies on the front, you can stick your hot chocolate there while waiting for your shoes to dry. So next time our systems crash I'm going to know why. IT can say what they want, but I'll know better! Of course, you'd see something like this from someone who likes to ride around in lightning storms. Perhaps he needs some counseling for his fascination with potential electrocution situations. What's next, current to the rivets of a Brooks saddle because it helps keep the cadence up? Does anyone ever complain about that mysterious foot odor emanating from the direction of the servers? Lol I thought I was the only one who did this... Well not with shoes since I couldn't figure out a good way of holding them in place, but many times for socks. We have a computer cluster, so I can put the socks in there and then load up a CPU intensive task. Alex - This is the first time I've ever put shoes in there. I've never thought of increasing the CPU load on the server... my stuff has all day to dry, plus Apertome might hunt me down. Watt graduated from Waterloo Comp Sci. Must be quite the nerd, especially working on Computer Algebra. Nice link and nice shoe drying trick! I'll have to post pictures of the refrigeration compressors in the basement we share with the natural food store in our building. They make a great clothes dryer.